It's something we don't hear much of these days, but Christmas Clubs (or Holiday Helpers) used to be popular way to save for the year-end spending spree. They are short-term savings accounts into which holders dutifully deposit money all year, and the bank doesn't allow withdrawals until the holiday season. This scene above is from the vintage photo wall display at Bridgeview Bank, reflecting its long-time legacy as Uptown National Bank. (The photo is also reflecting the hallways lights and exit sign, so sorry for the poor quality, couldn't be helped.) 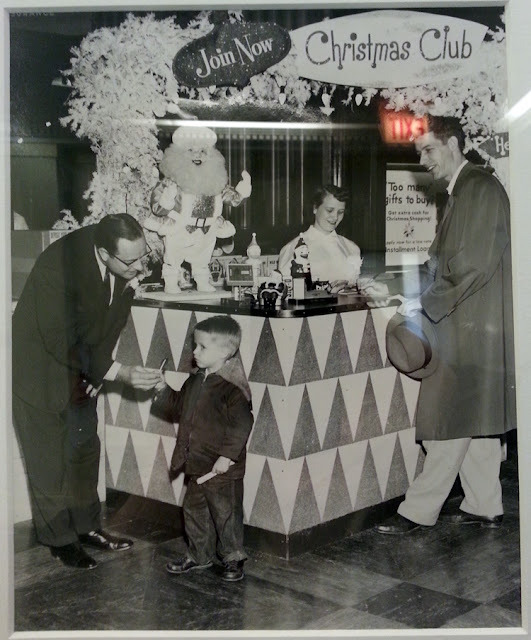 We're guessing it's from the 1950s, and yeah, that Santa is just plain creepy. We hope you had just the right amount of money saved to pay for your gifts -- whether you had a Christmas Club Account or not -- and wish you a happy holiday. Had a savings account every year!